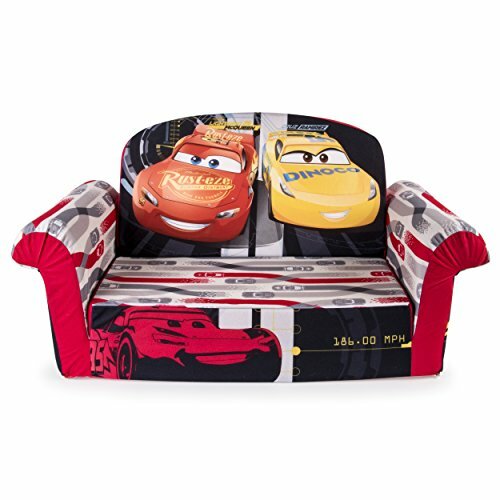 Preschoolers can sit, lounge, and relax on their very own sofa along with their favorite Cars 3 characters with the Disney Pixar Cars 3 Marshmallow Flip-Open Sofa. Just the right size for toddlers, the lightweight polyurethane foam sofa with removable polyester fabric slip-cover stands about 10 inches tall, 28.5 inches wide, and is 16 inches deep. It's decorated with fun graphics, featuring Mickey's cheerful face and all his Clubhouse friends are sure to brighten any room. Kids can use it as a traditional sofa / chair or have fun flipping the seat over to turn it into a lounger. The lounger, which extends to 39 inches, features vibrant and colorful graphics of Lightning McQueen, Cruz Ramirez, and Jackson Storm for even more room to play for your little speed racer to play.. This functional two-in-one sofa is a comfy spot for kids to sit, read stories, watch movies, eat snacks, play or just relax. Not only is it comfortable, but durable, and easy to clean. The slip-cover can be removed using the child proof zipper on the bottom and then machine-washed with mild soap in cold water. The Marshmallow Flip Open Sofa is a perfect birthday gift for at home play and relaxation, practical addition to your child’s room, living room, playroom, cottage, vacation, daycare and sleepovers at grandma’s or grandpa’s house for a comfy napping spot. Perfectly sized sofa/chair for toddlers that gives them a spot they can call their own while they read, eat snacks, watch TV, or fold out into a lounger and play or take a nap. Made of lightweight foam, kids will love to move it around from room to room themselves, flipping it open into a bed or folding it back into a sofa. This soft, foam seat makes a great birthday present for any toddler 18 months+ for their play room, bedroom, living room, day care, sleepovers at grandma and grandpa's, vacations, or nap time. Polyester fabric slipcover features a safety zipper without the traditional zipper pull and is machine washable. As a sofa stands 10" high, 28.5" wide, and 16" deep or extends out to 39" long as a lounger. If you have any questions about this product by Marshmallow Furniture, contact us by completing and submitting the form below. If you are looking for a specif part number, please include it with your message.